Exciting news! You can now send property alerts yourself as soon as you’ve listed a property. No more waiting for property alerts to go out the next morning. Property alerts are an excellent marketing tool to send your properties to as many people as possible, and now you can increase the chances that you will be the first person to present the property to buyers. This is very important in the case of an open mandate as buyers could be working with multiple agents in the area so the first agent to present the property to the actual buyer will get the sale. After ticking the property alert box when editing or uploading a property, select this option in your admin console. 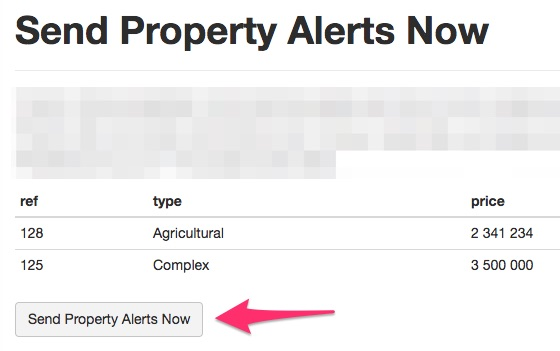 The list of property alerts to be sent is shown in your admin console. It is important to keep adding as many subscribers as possible to your database by collecting emails at show days, email enquiries and other personal interactions. Please be sure that you only add valid email addresses and only add email addresses you collected yourself. If you have a large list of subscribers you would like to add, please email support@webbox.co.za and we will gladly add them for you. Please give this new feature a try and let us know what you think.